Tastee Treet was built in 1955. At that time, the restaurant was just a walk-up-to-window style service. There was no inside seating; only a window to place your order and a few picnic tables surrounding the outside of the building to eat. The current owners, Larry and Mary McKern, purchased Tastee Treet in the spring of 1986. In 1997, the old building was torn down and a new, log cabin style building was built. The current building provides seating inside for 25 people. There are also some picnic tables outside, under a covered roof, with a view of the Wabash Trace Nature Trail. Larry and Mary McKern were born and raised in Council Bluffs, Iowa and both were graduates of Lewis Central High School. They were married in 1975, and have 2 children; Eric and Megan. Larry has been the owner/operator of Tastee Treet since they purchased the resaurant in 1986. Mary is a nurse at Methodist Jennie Edmundson Hospital. Eric has worked part time at Tastee Treet for many years. Megan is currently the full time manager of Tastee Treet. Larry and Mary also have 3 beautiful grandchildren, Ryleigh, Mason, and Lyla. 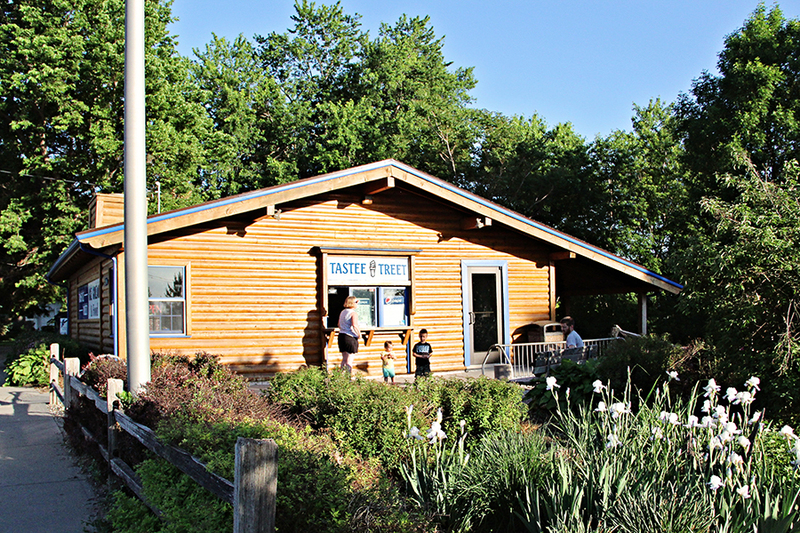 Tastee Treet offers a variety of food ranging from burgers to BBQ. There are many sandwiches offered at Tastee Treet including regular and specialty burgers, BBQ sandwiches, tenderloins, and pizza burgers. The BBQ includes pulled pork, beef brisket, and pulled chicken. We also offer a variety of side items such as French Fries, BBQ Beans, Cole Slaw, and Sweet Potato Fries. Don't forget about the best Cheeseballs in Council Bluffs! And of course, Tastee Treet offers some of the best ice cream treats in town. Ice cream cones, sundaes, shakes/malts, and banana splits are great for dessert or as a snack to beat the summer heat. Hours may vary. Call ahead during inclement weather.